In Harry Potter and the Deathly Hallows, Nagini seemed to be able to see Harry and Hermione though Harry's invisibility cloak while they were visiting Harry's old house in Godric's Hollow. Harry had the strangest feeling that she knew that they were there, and also who they were. Just as he reached this uneasy conclusion, she raised a gloved hand and beckoned. Could the snake actually see them, or was it all based off of the assumption that someone was in front of the Potter's house and that it could be Harry? Adding on, I'd like to add this (under Behind the Scenes). It may be unreliable, but let me elaborate. Many things could detect the Cloak, as we see in the series, such as the eye that Moody possesses, and the Marauder's Map. Now, the last bit sounds interesting. It was also unable to hide Harry from creatures able to sense location by methods other than primarily sight, such as Dementors and Nagini. Animals that use senses to roam could be able to see under the Cloak (possibly echo location, and snakes). Dementors can as well, which may lead to snakes being able to. Emotions such as fear can be sensed by Dementors - if you possess fear, they may be able to know where you are due to this, Cloak or not. As it only protects the user from some spells and sight, I'd assume the latter is correct. Although different, Mrs. Norris, and Crookshanks may have sensed the presence of the Cloak as well. As Dementors can sense Cloaks via a way of sensing fear, it reinforces the statement that snakes can sense the Cloak via smell, and possibly heat. Snakes don't see very well, they sense (and hunt and navigate) almost entirely through heat and smell. Nagini is most likely a fictional venomous Python. Pythons have heat receptors like pit vipers do. Jess: How did nagini could see harry and hermione if they were under the invisibility cloak? Nagini is some variety of cobra -- she has a hood -- but I believe the author mistakenly conflated her abilities with that of a pit viper. 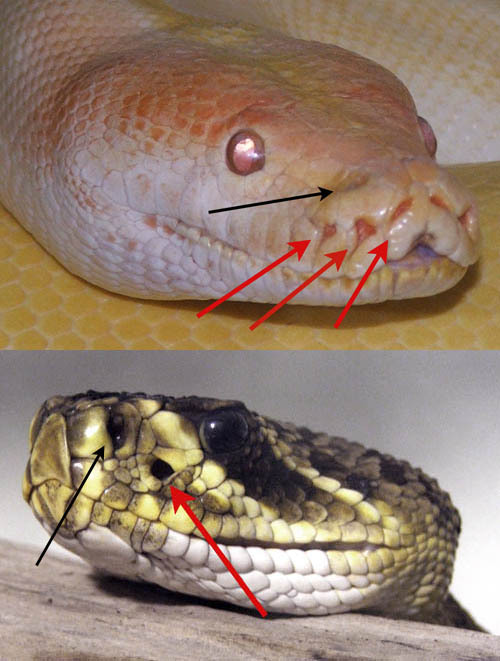 Pit vipers have heat sensing organs in their heads (see the picture below) which give them basic infrared sensing. Cobras, however, do not have heat sensing organs and, combined with their relatively poor senses (aside from sight, which is fairly good), it would make no sense for a cobra to be able to sense an invisible person. That said, this is a series about wizards and heavily features magic. The cloak only prevents sight, the snake is an unrealistic green color for a cobra -- either JK Rowling made a mistake (likely) or a wizard did it. This is speculative, but considering that Harry could feel the presence of other Horcruxes nearby (being one of Voldemort's horcruxes himself), and Nagini was a Horcrux, it's very possible that she could sense his presence. As with Harry, even though he could sense other nearby Horcruxes, he did not immediately recognize that it was because he himself was one. Similarly Nagini may have sensed the presence of something there, but not known exactly what it was. Considering that the snake was there to essentially keep an eye on Godric's Hollow, it would have been wary of anything suspicious, including an odd sense of something there, so would have at least investigated it. It just so happened to be the very person she was waiting for. In addition, Harry and Hermione were in possession of the locket Horcrux at this point as well, therefore their presence would have been twice as potent to the snake. This may be why it could sense them long before they realized it was there. The cloak, as the Deathly Hollow, is completely invisible as Mr. Lovegood explains in the Deathly Hollows on page 354 we can presume the snake couln't see him or smell him or anything alike. impenetrable concealment, no matter what spells are cast at it. Even if Nagini could somehow, Harry looked and smelled like another man since he was under the influence of the polyjuice potion. However, the horcruxes can feel the presence of one another as they are essentially parts of the same soul and I think that is how Nagini knew Harry was there, even though, later on, it had to confirm before calling Lord Voldemort. Magic dammit! Or maybe smell or movement sensing. Most of the other answers* here involve a snake's ability to detect heat. The trouble I have with this is that snakes detect heat at a distance by "seeing" in the infrared. Since infrared - like visible light - is a sub-continuum of the electromagnetic spectrum, I'm inclined to think an invisibility cloak would block infrared radiation in addition to visible light, so I think it is NOT Nagini's ability to sense heat. As others mention, snakes have excellent senses of smell, so Nagini might have used that to detect Harry and Hermione. Snakes also feel vibrations that would give away their movements. Of course, it's possible that some magical ability (horcrux detecting another horcrux, enchantment to counter invisibility, etc.) allowed her to find them. *Some even citing Rowling, which tells me she probably hasn't done a good job researching this and thinking it through. One more physics angle: Humans emit a Hotbody radiation of infra red at 37 C and snakes are able to recognize them in one-meter distance. Assuming now the Invisibility Cloak only skips visible light,Then the cloak is susceptible to the infrared radiation. So the snakes can sense them. Even cat of Finch does in the first part. Now given the design of the Cloak, it was said that the Death gave him this cloak so that no one can find him. Should mean that cloak should not be sensed by any creature. Kind of a paradox to me. So Horcrux explanation stands well!!! Harry potter himself was the 7th and the last unwanted horcrux that Voldemort accidentally created while trying to kill him in Godric's hollow on the night Harry's parents died. All the horcruxes of Voldemort had a connection (because of which Harry could sense the cup in Gringott's bank, Harry could see and find Voldemort in deathly hallows part). Also, as Dumbledore said in the Half Blood prince, dark magic like that of Horcruxes has traces. I believe that's why Nagini could sense the presence of Harry even beneath the invisibility cloak. What Kind of Snake Is Nagini? Could cats see through the invisibility cloak? Why didn't Nagini sense Harry at the shrieking shack? If Voldemort had planned to kill Lily, would her sacrifice have saved Harry? Did Hermione know that Harry and the fake Bathilda were speaking Parseltongue? Why didn't Harry Potter use the Disillusionment Charm?